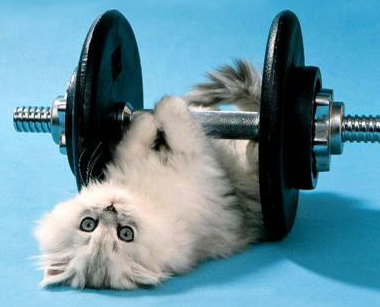 It’s the Holiday Season – How’s the lift going? Recently we took a look at the history of the Holiday Lift. As you recall, overall the peak has dropped considerably since 1992. At that time the peak of the lift was over 40%. In 2012, it was down to +23% – a decrease of over 40%. Remarkably, the lift for November has remained relatively constant through the years at about +7% – despite the increased hype over Black Friday and even with the kickoff time being pushed up to Thanksgiving day and earlier. The Retail less Auto and Restaurants is the most relative overall view for the Pet Industry. Note that November was up 2.4% over last year. However, since October YTD was up 2.7% November sales actually lowered the YTD increase. Grocery had a good month but not enough to make a difference in YTD overall. November is traditionally not a good month for Drug. This year, November didn’t match the YTD rate of increase. Building, Hardware and Farm stores – Fall/winter is not their season but they are holding their own. The General Merchandise Stores, including Department Stores, Discount Stores, Clubs, SuperCenters and Value stores expect and need a strong Holiday Season. 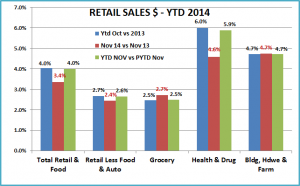 November sales were up 2.3% – not much but it is better than the YTD rate so it helps. The Internet/Mailorder Channel was up 6.3% in November, slightly below their October YTD rate so November was a slight drag overall. 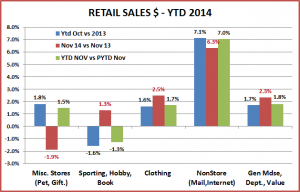 Clothing and Accessory Stores had a good November. This channel depends on a strong Holiday Season. Sporting Goods, Hobby and Book Stores – November sales were up…finally. It will be very difficult for this Channel to break even for the year. Miscellaneous Stores includes outlets like Florists, Gift and Pet Stores (Pet is about 20% of the total outlets). November was not good…as sales were down -1.9%. December is the most critical month in this channel. We have looked at November’s sales. Overall it was an OK month, give it a “C” or “C-“. How does this affect the anticipated Holiday Lift which starts in November? The next 2 charts will compare this year’s November “lift” to the ones in 2012 and 2013. 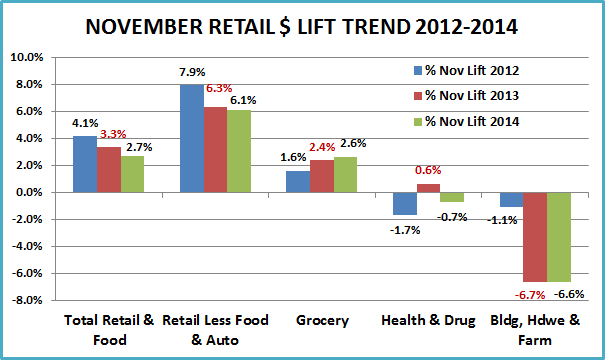 Overall the lift in November is definitely trending down. However, there is a factor that is “unseen” in the data. We have noted that VALUE is increasingly becoming the key driver in consumer purchasing behavior. Thanksgiving is the kickoff time to the holiday “deal” season. Consumers often delay purchases until then. In 2014 Thanksgiving was on 11/27. In 2013 it was on 11/28. However, in 2012 Thanksgiving was on 11/22 – 5 or 6 days earlier. This meant that in 2012 the November portion of the holiday season had almost a week more of intense shopping so it is not surprising that the lift was higher. Retail Less Restaurants and Auto – Had almost an 8% lift in 2012. 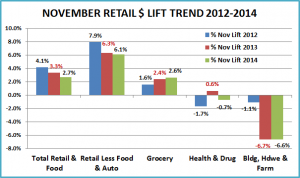 The extra 5-6 days of shopping probably pushed November up close to an additional 1%. However, even allowing for this “bump” in 2012, the subsequent years are still trending downward. Grocery is not traditionally a channel with a big holiday lift. However, you can see that this big segment is steadily improving. The lift in Drug usually occurs in December. November is often flat to down. The late fall and winter months are not a “lift” time for Building, Hardware and Farm stores. The drop in 2014 was similar to the pattern in 2013. In the next chart we will take a look at Miscellaneous Stores which includes Pet and Gift outlets along with some channels that are impacted early and strongly by the Holiday lift. General Merchandise stores are big drivers in the Holiday Sales Season. They are big promoters and try to push the kickoff time up a little bit. The lift has increased slightly in November each year since 2012. The Internet/Mailorder has had the greatest overall holiday lift. In this chart you can see that, while still substantial, the November portion is trending down. Part of this is due to the fact that this segment has substantially increased everyday sales so the Holiday lift is less pronounced. Sporting Goods, Hobby and Book Stores – A substantial increase every year since 2012. 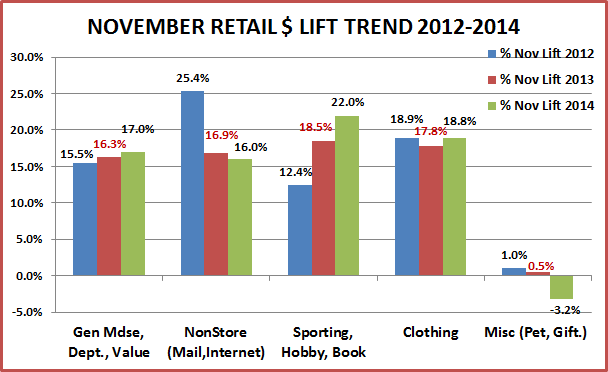 The November lift has remained relatively strong and steady for Clothing stores. 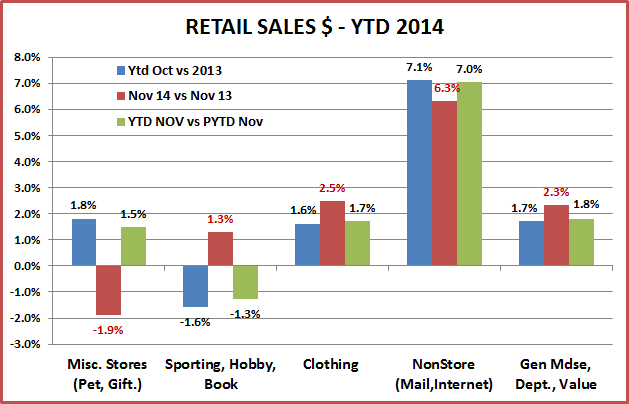 Miscellaneous Stores (includes Pet and Gift) didn’t have a good November. The bulk of the lift in this segment comes in December but in 2014 they’re starting out “in a hole”. 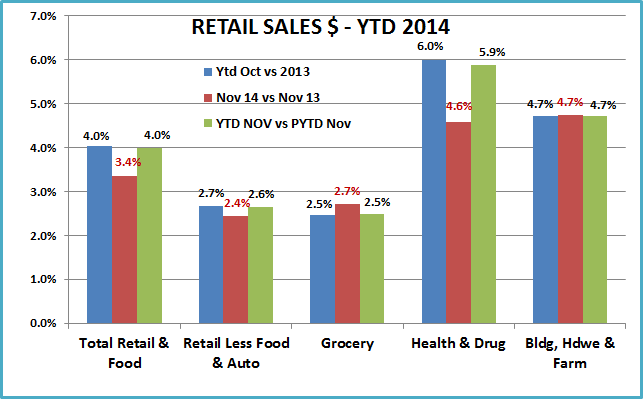 In November the Retail Sales for all channels less Restaurants and Auto was $314B – up $7B (2.4%) from 2013. It will be the third biggest month of 2014 – behind only May and of course December. By the way, a reasonable estimate of December sales this year is $365B vs last year’s $356.5. Regarding the November portion of the lift, it seems to be trending down slightly. Moving up the kickoff of Holiday shopping may help…at least when it is done by the calendar…and especially when November 1 is on a Thursday, which can give us up to 6 more “official” holiday shopping days in the month. By the way, in the midst of the Great Depression, President Roosevelt tried to move Thanksgiving to the third Thursday of the month (from the last Thursday) in the years 1939-1941. Some people say he was urged to do this by Retail executives in order to extend the Holiday shopping season. The effort ultimately failed and Thanksgiving was set as the fourth Thursday of the month by an act of Congress which was signed by the President on December 26, 1941…less than 3 weeks after we entered World War II. So I guess we could write our Congressmen….or better yet…..Enjoy the Holiday Season and have a great New Year!